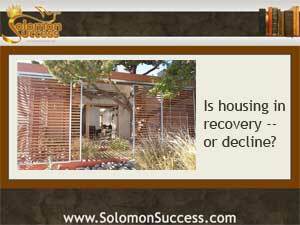 Solomon Success > Blog > Is Housing In Recovery – Or Decline? One of King Solomon’s key pieces of advice for investing – and living – well is to practice prudence and discernment in every endeavor. That’s good advice for investors to keep in mind today, as conflicting reports about the state of the housing market’s health continue to roll out. Now, new figures suggest that the much-touted rebound of 2013 may have been a fluke. Or not. Although the housing market overall (and the many small markets that create it) hasn’t come near the crisis point it hit back in 2008 when so may homeowners fell into foreclosure, it’s turning out be far flatter than expected. Those encouraging numbers from last year had fueled hope for a much stronger performance by this time, with a corresponding jump in employment and overall consumer activity. But so far that hasn’t happened. Sales of both new and existing homes are down, and the number of new mortgage applications has hit a 14 year low. That correlates with weaker than expected job growth and a slump in overall consumer confidence. Economists and financial experts point to several factors that could be contributing to the downturn, but what’s motivating them isn’t so clear. Mortgage applications are down for sure – but is that because of a lack of consumer confidence in housing or the simple fact that the newly implemented Qualified Mortgage Rule’s higher standards shut out many who might otherwise be buying houses? Other possibilities involve the massive but little discussed ballooning of student loan debt, which may be keeping young buyers out of the market, and a stubbornly flat job market. Or rising home pieces, once hailed as a sign of recovery, might be pricing some hopeful homeowners out of the market. But a recent article on The Daily Ticker floats the theory that the housing recovery of the last couple of years was only an illusion anyway, caused by investors who bought large numbers of foreclosed houses at bargain basement prices. That kind of activity, the argument goes, artificially inflated the numbers on home sales and failed to reflect the absence of residential homeowners from the equation. Now, though, housing prices are up, and those cheap foreclosures just aren’t in the pipeline in the same numbers as before. And although interest rates are staying low for now, the tighter mortgage standards – which affect investors too – account at least in part for the slowing of mortgage applications. Those factors, say market watchers, probably won’t change any time soon. Can Math Skills Help the Housing Recovery?